Unit photos for Outdoors & Missions/Music camps. Welcome to Young Disciple Youth Bible Camp! The view of the lake overlooking the girls' camp. These people are enjoying the view of the lake while they are being ferried across, one of the ways to get to camp. Almost there! Once the campers arrive at camp, it is time to register. It is always exciting to find out which unit you will be in and who your roommates will be! After registering, the campers get settled in at their accommodations - simple cabins, army tents, or tents like these. Next comes the ice-breaker activities. This gives the campers a chance to get to know one another with fun activities. After the icebreaker activities, it is time for the very first line call. Mr. Kim shows everyone how a proper line call should be. Attention! There are several line calls throughout the day to bring everyone together and regroup before going to the next activity. Mr. Kim has his son demonstrate the proper push-up. Straight from shoulders to feet! At orientation, the Camp Director, Mr. Ted, and the head boys' and girls' counselors go over the rules of camp. You might even win a prize like these girls did! A day at camp starts off with devotions, one of the most important activities at camp. 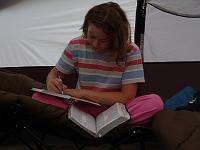 The campers learn how to dig deeper in God's Word for themselves. Many campers tell how they are excited about having devotions in the mornings by the end of the week, and how they learned to really enjoy having their daily devotions. After personal devotions, each unit has their 'Unit Sharing' time. Each camper & counselor share a special thought that they learned in their devotions. The first line call of the day comes right before breakfast every morning. At this line call, one person from each unit shares a thought from their devotions that morning. You'd better be on time to line call, or else you'll be doing push-ups like this guys' unit! The morning exercises are a memorable part of camp. These girls are doing the High-Jumper! The push-ups are the favorite exercise of most campers. 1, 2, 3, 4! A little twist on the push-up - the resistance push-up! Sometimes, there is even a little time for marching before breakfast. After having prayer for the meal, each unit is dismissed for breaktast. Be sure to get some hand sanitizer before getting your food!